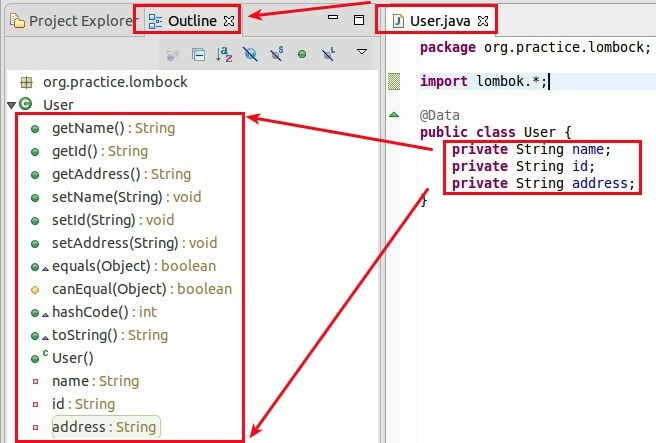 In this article we are going to see how can we use lombok inside our regular Java Code to minimize code length & redundancy. Lombok , a compile time annotation pre-processor that helps to inject some code in compile time. Before going in detail, i request you should see the video from their site . I am not going live demo like this but I will show how we can use this inside project (including maven life cycle) . Let's start with basic understanding. As I have told, lombok is a compile time annotation pre-processor. What does that means? Lombok has several Utility / feature . We will go through main items of them that I have used so far. Note : To know about annotation , you may see my this post. 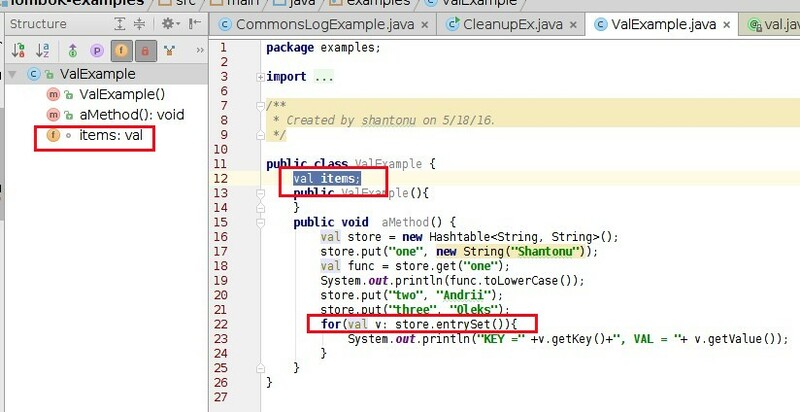 I will use Maven (you may use gradle in same manner) . 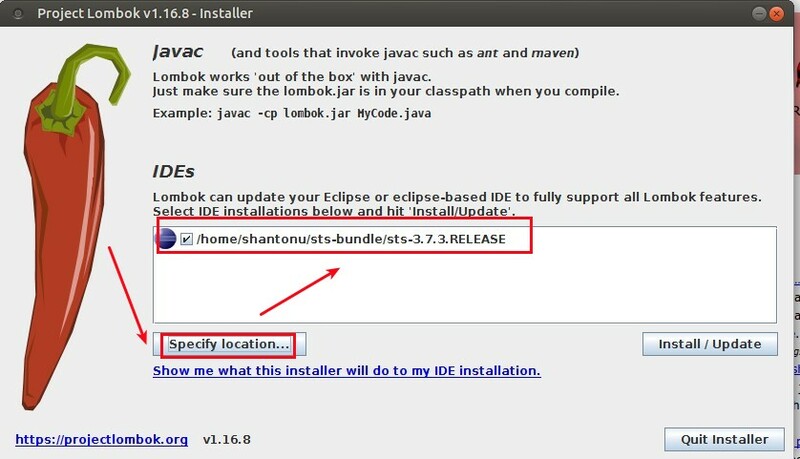 My Maven version is 3.3.9. You may get updated version from maven central. You can see, I have defined the source & target version to 1.8. Step 3 : Now we need to add lombok plugin for working during project compilation. For this we need entry in plugin Management and add plugin with parameters in build section. 2. you can see I use 2 goals, these are spacial goals defined for lombok for test & source scope definition. I use both as my test code also needs lombok. So, my Build section is become this. So, finally my build section of POM looks like this. 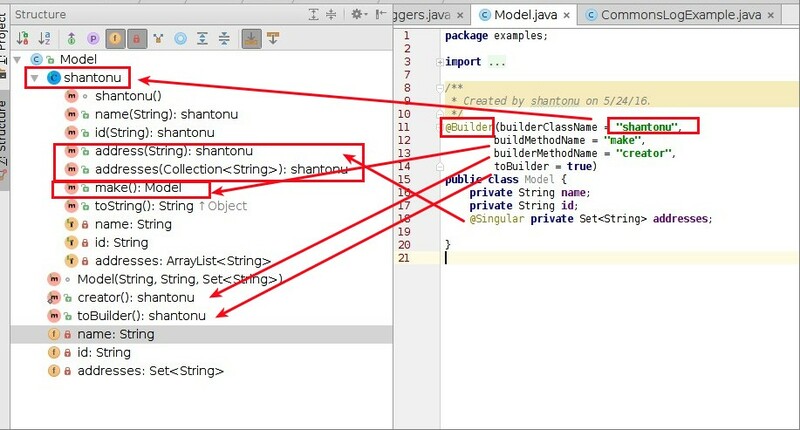 IntelliJ: View -> Tool Buttons , you will structure. @Getter @Setter : It heps to make getter setter with variable. It also supports access level parameters to define scopes of getters & setters. 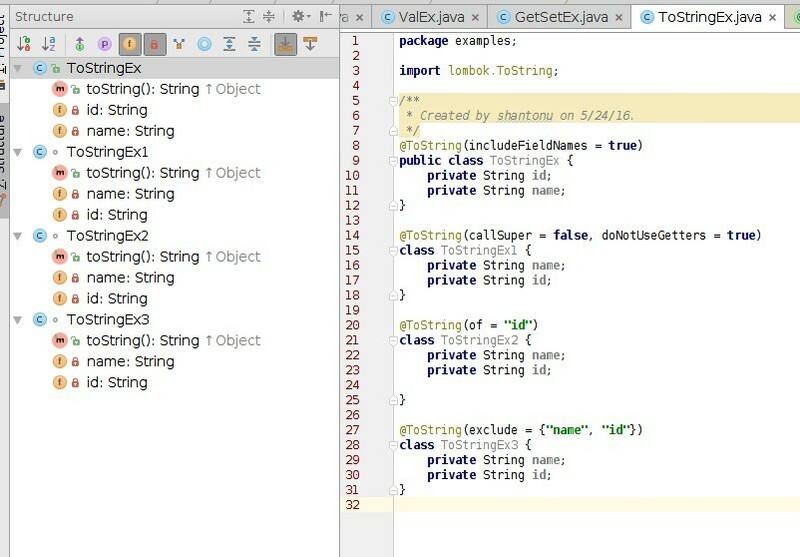 @ToString : This is implementation of toString(), we can use only for the class level. doNotUseGetters() : boolean type => avoid using getters of the fields. @Data : It is combination of multiple annotations. @Value : This is just an immutable value type of @Data. 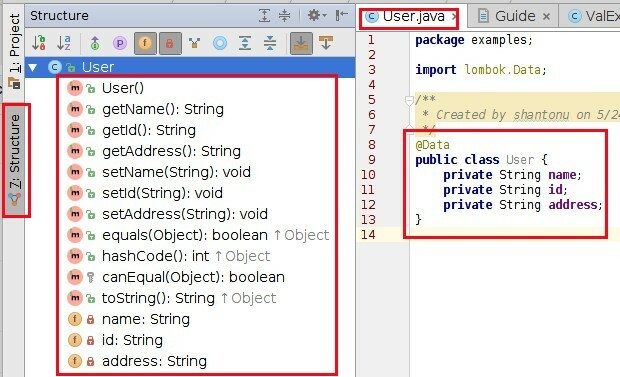 @Singular : For notifying a collection (support guava & java util only) . It include 2 adder methods, single add, add all. 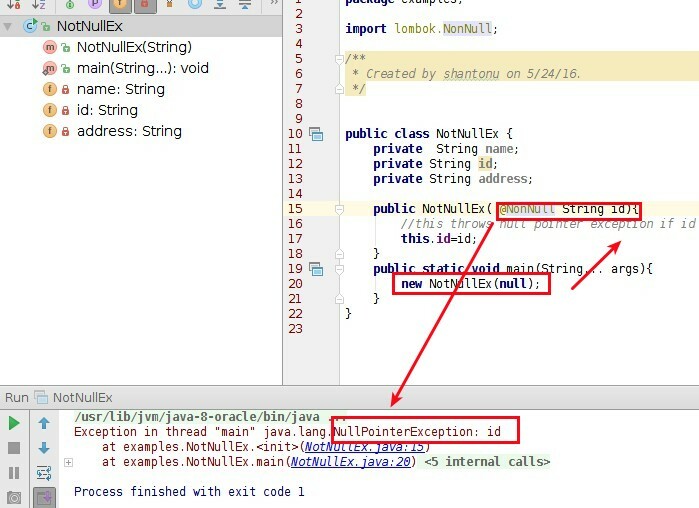 @NotNull : This will add null check on variable and throws null pointer exception. @EqualsAndHashCode : It simple add equals(Object other), and hashCode() to class. (so it is class level annotation). It supports parameters to customize those equals and hash code methods. All parameters are same as @ToString. @Cleanup: It is a easy way to cleanup the resources. 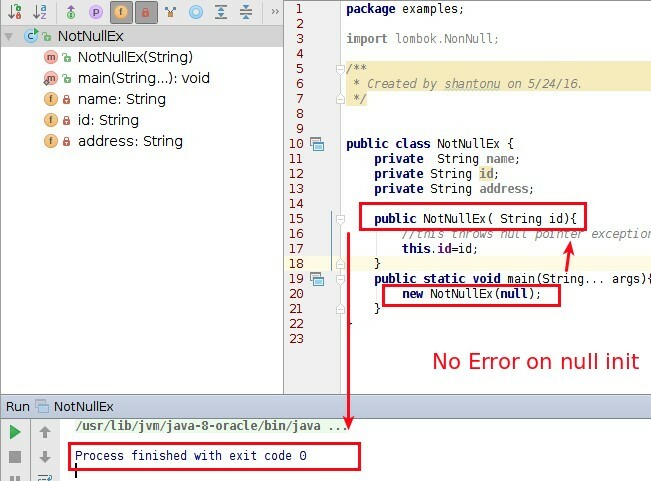 It actually ensures , the resources close() method will be called in finally block of try. You can see a simple example from here. No need try catch. Note : In my opinion, it is nice to use this when you are not caring about managing resources. If you like to use your resources by your logic, better avoid this. Example, multi threaded resource usages. @log: This is one of the best usable feature. This picture shows all loggers to gather. My example in github will shows details. Parameter : it takes topic as parameter , by default it is class name. we can set log topic. Note : for different log implementation we need different type of configuration. Lombok doesn't provide any configuration help, it just inject code. So, we need to add depend on what type of log I am adding. My example in github contains all 6 types of log configurations. See pom file carefully to know dependencies as well as resources for configuration files. Note : There are lot more regular feature and experimantal features I skipped due to not scope of my tests(spatially @Synchronized) . I will add other one by one in github repository and add referrence notes here. Lombok is quite useful. Love it.